Celebrating its 40th anniversary, the Institute for Small Business and Entrepreneurship (ISBE) Conference, came to Belfast on the 8th and 9th of November. The ISBE Conference has become one of the major events in the entrepreneurial calendar; bringing together over 350 highly-acclaimed academics, speakers and business leaders from over 35 countries, to inform, engage and debate the issues relating to small business. Building upon IOEE’s long and successful partnership with ISBE, we were delighted to be a part of ISBE’s celebrations this year as a sponsor of the annual conference. During the two days, experts debated the latest research in small business and entrepreneurship across 16 themed tracks, including Gender & Enterprise, Business Creation and Family & Community Business. This year’s conference theme ’Borders, prosperity and entrepreneurial responses,’ while influenced by the advent of BREXIT and its possible impact on small businesses and entrepreneurial endeavour, also recognised that ‘bordered thinking’ can exist more widely in entrepreneurship research and practice. The conference opened with a welcome from Professor Paddy Nixon, President of Ulster University Business School, followed by an address from Lisa Toland of Belfast City Council who spoke about the City’s significant investment in small business and entrepreneurship. On the second day, delegates were invited to tour the Council’s business incubator, Innovation Factory, and meet with some of the entrepreneurs and business-owners it supports. Keynote speaker Professor Barbara J. Orser of Telfer School of Management, University of Ottawa, shared her thoughts about how academia can build bridges across ‘bordered’ thinking. Professor Neil Gibson, Chief Economist at EY (Ireland), then asked the question ‘Why are borders coming back?’, considering the socio-economic drivers at play, and highlighting the opportunities that radical change can offer. Headline sponsors for the international conference were Ulster University Business School (UUBS), Belfast City Council and the Federation for Small Business. Here at IOEE, we were proud to be a High Level Sponsor for the conference, along with Visit Belfast. “The event provided delegates with an opportunity to meet with like-minded individuals, to present their latest research and to hear the research output of others, and to listen to keynote speakers who spoke with passion and authority on their subject. They had an opportunity to engage in debate about current issues in entrepreneurial research, to be provoked, stimulated, and engaged. They had opportunities to meet long-standing friends and to make new ones”. 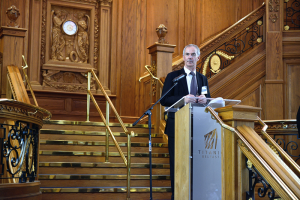 Delegates also enjoyed the conference’s Gala Dinner at the Titanic Belfast where they were entertained by traditional Irish dancers and a keynote speech by Dr James Nesbitt OBE, Chancellor of Ulster University, actor, comedian and entrepreneur. The official ISBE 2017 video is now available at http://isbe.org.uk/isbe2017/video/ and photographs of the conference are available to view here. The 2018 ISBE conference will be held in Birmingham from the 7th to the 8th of November. More details are available at http://isbe.org.uk/isbe-2018/.